When I purchased my little brass lamp I had no idea if I had gotten a good deal or not. I new it was old and solid brass and I just loved the shape of it. I had looked at it at the antique mall several times and left without it until one time I decided to bring it home. The photo below is from the first post that I shared it in. Well today I was looking through the vintage sales on One Kings Lane again when I spied this vintage bouillotte lamp. Hey, that looks just like mine. It is just like mine, but they have the candles stuck in it which I have not done yet. Now just look at how much it is for sale for. What? $749? I had never heard of Chapman Lamps, but that is what I have. I found the label on it and it was made in 1972. Now, I know I got a really good deal. I only paid $79! Yep, a whopping $79. Oh, but look at what the estimated market value is that I copied from OKL. The lamp is for sale at 55% off. Wow, I saved $1570 from the estimated value or $670 from the sale price! Don't you love finding out you got a really good deal? It's a rainy day in Georgia. Holy cow, that is awesome!!! That is the best feeling in the world! Beautiful lamp... even better with that price tag! I'd say you got a GREAT deal and a great looking lamp. Way to shop! 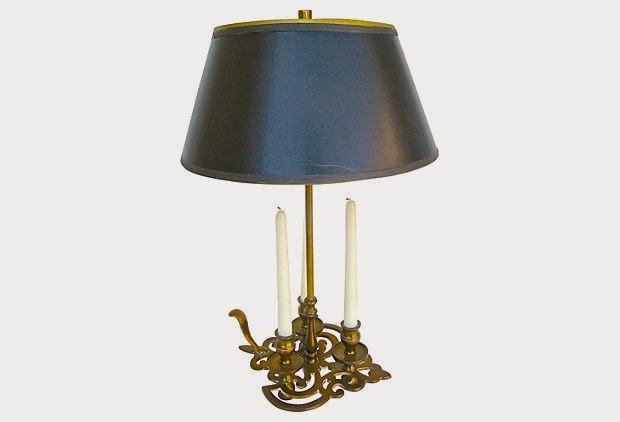 The lamp is amazing!....It's also going to be a "rainy night in NC"
I love Bouillotte lamps! I have one that I bought at an estate sale that I love. You always find the best deals... but then you have an eye for quality and what you love! Enjoy your rainy day! Wowzer Kim! You got an amazing deal and I love that lamp. Raining here today too. Those are the very best!!! Makes you feel like a million bucks, doesn't it? :)Plus it is a beautiful lamp to boot! No rain here as yet....just blustery winds. I have the house all opened... rain is expected later today though. That is an awesome find. Love the unique features with the candle holder base. So pretty. Woooo Hoooo girl that is a great deal. What a deal! And what a beautiful lamp as well. It takes someone with a good eye to spot those. 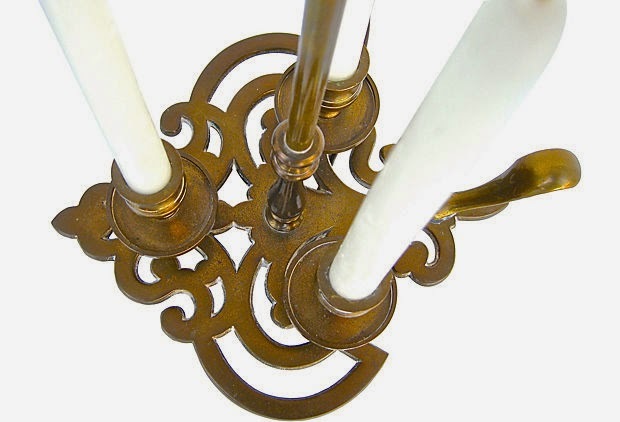 I have a pair of antique brass candlestick lamps in the shop and not too many take notice. I especially love deals on awesome items like your lamp. I have lamp envy now:) Great deal Kim! WOW...doesn't that make you feel GREAT! Such a pretty lamp and you got a great deal! It's a rainy day here too. Yesterday it was in the 70's and sunny, for the next few it is in the 40's and rainy...come Spring!!! Wow what a beautiful and unique find! You have a great eye for beautiful pieces Kim! And what a steal! I love deals like that too kim! I once got this ginormous brass dolphin for $25 and saw it for $450 on 1st dibs! I think the key is, just like your beautiful lamp, if it's really beautiful, it really will have REAL VALUE monetary wise in the end! So happy for you! Wow! That was an amazing deal you got on that lamp! I had no idea it was ever that expensive. I like how it looks with the candles in it too. Kim, I always say you have a good eye for beautiful things! Wonderful bargain... fabulous lamp! Goodness gracious, that is an awesome lamp and what a deal! Can't believe it! Love your taste girl! Wow! Not only did you get a great deal but a great lamp too! I love a bargain! You're so much clever than I! I found one in an empty-your-attic sale and I loved it, but it was a little more expensive than what I could pay. Then, back home I checked and they were so expensive on the Internet. I went back, but it was too late. Yours is lovely! That lamp is gorgeous, Kim! Love finding a bargain! That is an amazing deal, and it would really make my day! It is beautiful, too!